It is October, but the dahlias just keep on blooming. Some flowers are a little windblown and tatty, and the big blooms of dahlia ‘Crazy Love’ have been nibbled by earwigs, but they are still worth cutting and bringing indoors to cheer up a gloomy week. This is the second week of October and that’s three small fresh flower arrangements with no heated greenhouse or air miles involved. Flowers grown with the addition of homemade garden compost and watered with recycled bath water. I am rather pleased about that although it has been a battle with the slugs this year. 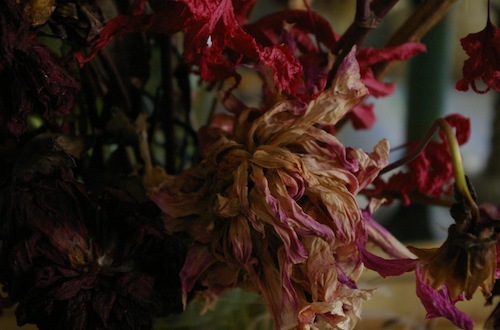 And, as I cleared away last week’s dying flowers I thought they still had a charm and grace in their faded condition worth photographing and perhaps using as the starting point for a scarf or two. Finally, even the zingy lemony yellow dahlia (a potluck purchase as an unidentified tuber) has earned its keep as I have realised it’s acceptable in a blue and white vase on the kitchen window sill. November, often relentlessly grey and misty here in East Anglia, is the time of year I put together my first dried flower arrangement for the winter mantlepiece. This past summer was warm and sunny enough for the acanthus to send up spiky flower stalks above their architectural leaves, and, along with some beautiful pale blue mophead hydrangeas, I’ve managed to create an understated floral arrangement to suit the coming winter light. 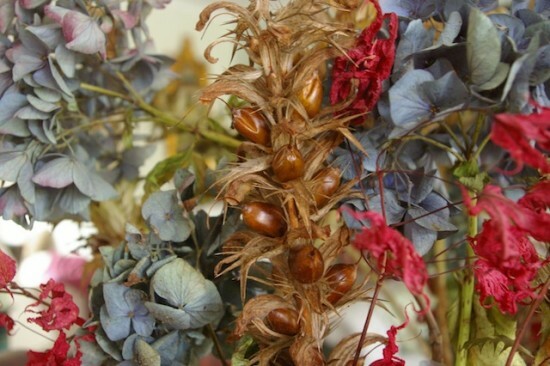 A dried flower arrangement of acanthus spikes, mophead hydrangea flowers and acer palmatum Osakazuki leaves. It looks low-key, ripened nature gently fading away, but as the central heating comes on in the evening and the room warms up the seed pods on the acanthus burst with a cracking sound like a fairground rifle and I jump out of my skin. The very first time it happened I even dived for cover. The seeds are forcefully propelled out across the room – none have hit me yet – hence ‘Russian Roulette’ springs to mind. Now, each time it happens it makes me laugh as I crawl round the floor picking up the bits. The benign mophead hyrdrangea flowers fade slowly to a pale bluey grey across the winter months. Halloween – bit of a party in some quarters so I understand! In the northern hemisphere it can be seen as a marker for seasonal change, abundance into scarcity, with roots deep back into pagan times. Certainly at this time of year there is plenty of fading and decay in the garden, but it can still be beautiful. 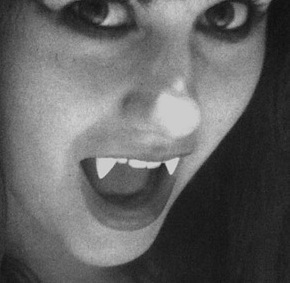 Oh – okay, then – as it’s Halloween here’s a bad-tempered vampire, irritated rather than demonic.